Mackinac Island is a beautiful, unique place and brides from across the country plan their destination wedding here. And why not? 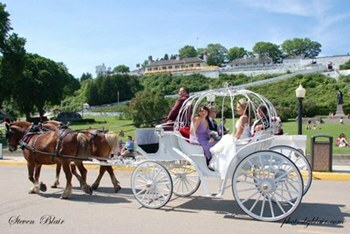 With jaw dropping natural back drops, horse drawn carriages, a variety of locations for weddings, rehearsal dinners, and receptions along with spectacular wedding services--wedding consultants, photographers, florists, honeymoon and guest accommodations, musicians, wedding clergy, salons, caterers, and bakers--make Mackinac Island a superb wedding spot. Mackinac Island is not a "new" wedding spot; weddings have been special here for more than 100 years. Mackinac Island is a magical place and that magic makes weddings very special. Carriages With no cars allowed on Mackinac Island, wedding guests and the bridal party can be transported to the wedding sites via taxi and carriage including a special wedding carriage for the newlyweds. Caters, Bakers, Florists & Spas From the perfect canape, to the wedding day hair styles, to the bridal bouquet, and the wedding cake, it's all available in style on Mackinac Island. Lodging Wedding parties and guests can enjoy a vacation during the wedding festivities and choose from sprawling resorts to quaint bed and breakfast inns for lodging. Photographers and Videographers Record the the wedding events with one of the Island's professional photographers and videographers. From the simple moments during the ceremony to the carriage ride to the reception, it will be captured for you to enjoy for years to come. Receptions Everything from on the beach to a on a boat! There are a variety of reception options that offer unique and memorable wedding receptions. Rehearsal Dinner From waterfront, to restaurant casual, to formal, rehearsal dinner options are plentiful. Wedding Clergy Mackinac Island's Wedding Clergy can make the ceremony personal and special. Wedding Coordinators Working with a local wedding coordinator can help you with everything from getting your guests to the island by ferry to the perfect location. Wedding Sites The island's four churches, Ste. Anne Catholic Church, Trinity Episcopal Church, Little Stone Church, and Historic Mission Church are popular wedding spots. Other spots include gardens, beach front areas, hotels or bed and breakfast, the Somewhere in Time gazebo, and Shepler's Wedding Charters.